It’s Spring! It finally arrived! And I am struggling to figure out where the last two months went! It seemed like January and February went on forever and now I look back over March and April and all I see is a blur! I spent March attending Jr. High Open Houses with the mission of finding a junior high for my daughter to attend in September (how did she end up in grade 6 already?! )…and filling out pages and pages of applications with her. Then I spent April preparing registration forms for my own students, sending them out and then taking them in. 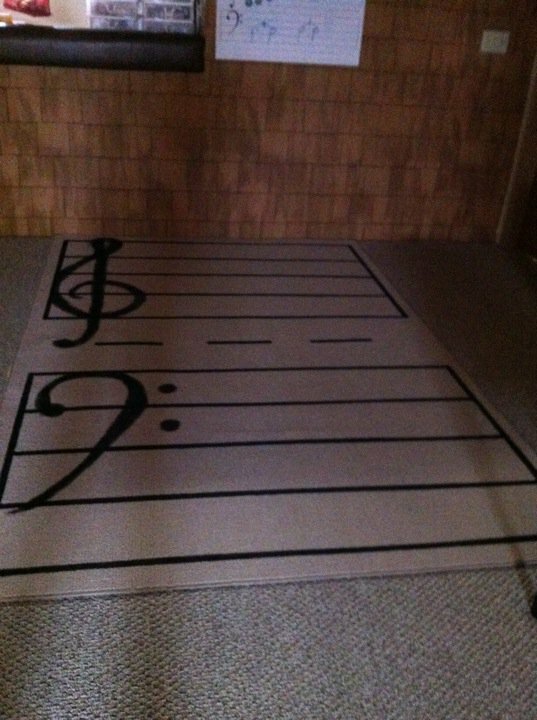 And, during that time, an entire long weekend making a few teaching aids that I am very excited about…including a 6 by 9 foot music staff that I painted onto an area rug! Now, most of the registration is in and it is so exciting for me to see how many of my sweet students are returning for the fall! It has been especially thrilling to watch my little Sunbeam 1 students blossom into great little musicians in such a short time and to have them all coming back next year is just so wonderful! The month of May will be spent getting ready for our year end recital and I am giddy with excitement about what’s on the program….if I do say so myself! I am very proud of the hard work that my students (and their parents!) are doing. This is another tough time of year: the beautiful weather and soccer and baseball season don’t always make for the most contented piano students. Many are restless, antsy and just wanted to be playing outside not sitting in music class or practicing….and I can’t blame them…yet they keep on practicing. Hang in there, everyone! There are just a few weeks left and I promise it will be worth your while…and I will have a special treat waiting for everyone at the end! A treat sounds really good right now, doesn’t it? I think I could use one…and maybe a coffee! Better yet: a London Fog! Mmmm….see ya later!